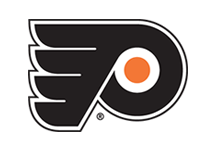 The Lehigh Valley Phantoms hosted their 5th annual Bleed Orange Blood Drive last week, in conjunction with the Miller Keystone Blood Center. Overall, 94 units of blood were collected during the event which is enough to save 282 lives! Even Phantoms defenseman, T.J. Brennan volunteered to donate blood to help save somebody in need. 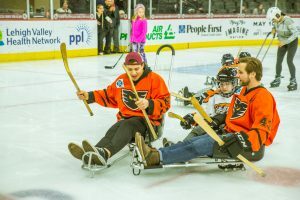 March 19 marked the final practice of the season for the Phantoms Charities Sled Hockey team. 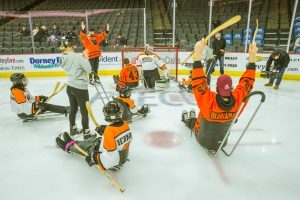 Phantoms players Colin McDonald, T.J. Brennan, Philip Samuelsson, Connor Bunnaman, Alex Lyon, and Reece Willcox surprised the children on the ice and joined them for practice. Each athlete was also given a stick signed by all of the Lehigh Valley players. Alex Lyon called it the most incredible and rewarding thing he has ever been a part of. 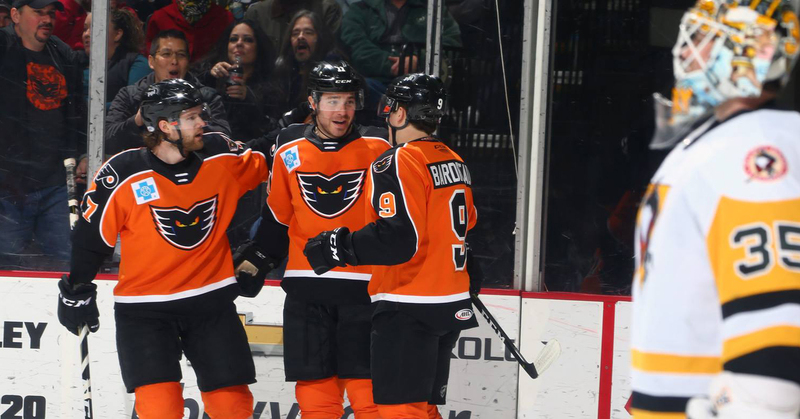 The Phantoms picked up a huge 3-2 victory Friday night in Wilkes-Barre as Nic Aube-Kubel scored twice to lead Lehigh Valley. Alex Lyon made 26 saves and Chris Conner scored for the second game in a row. 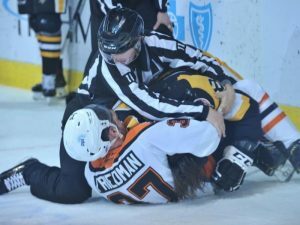 A crazy game ended with Lehigh Valley earning a point but eventually falling 5-4 in overtime on Saturday night. 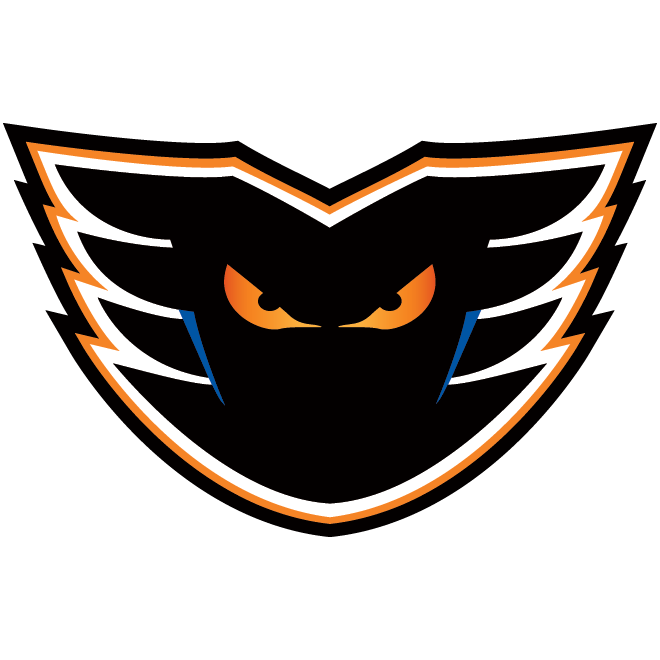 The Phantoms got goals from four different skaters as Philip Samuelsson, Cole Bardreau, Greg Carey and Byron Froese all found the back of the net. 12 different players earned at least a point for Lehigh Valley. 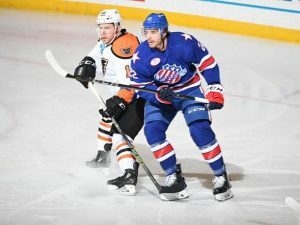 The Lehigh Valley Phantoms will make their only trip to Rochester this season for a Wednesday night matchup with the Amerks. 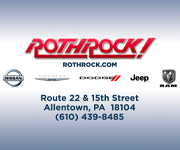 Lehigh Valley won the meeting with Rochester in Allentown, picking up a 3-2 shootout victory on January 19. Alex Lyon was sensational in the game, making a regular season career-high 49 saves. The Phantoms will travel to Cleveland this weekend for the first time as a franchise since January 11, 2009 when the Philadelphia Phantoms fell to the Lake Erie Monsters at Quicken Loans Arena. 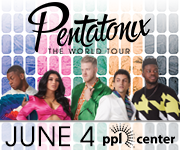 Lehigh Valley and Cleveland will conclude their season series on Saturday night. 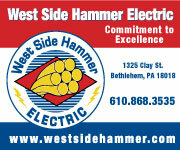 Cleveland won both games inside PPL Center when the Monsters came to Allentown on December 5 and 8. Cleveland enters the weekend 7-2-1-0 in their last 10 games and has moved into fourth place in the North Division standings. 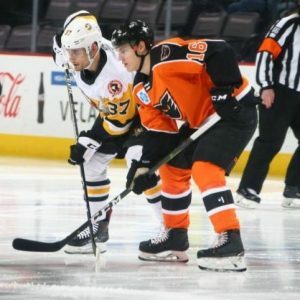 Nic Aube-Kubel has been finding his groove on offense, registering points in four-straight games, including a two-goal game on Friday in Wilkes-Barre. 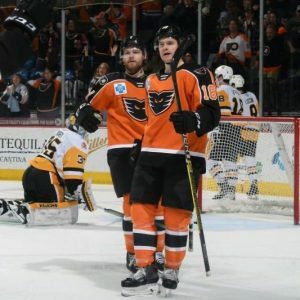 Byron Froese has been the Penguin Killer as of late, scoring all three of his goals with the Phantoms against W-B/Scranton. He has points (3g, 1a) in all four games against the Penguins since joining Lehigh Valley. 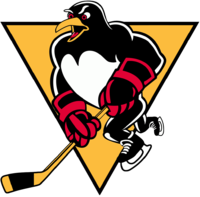 Lehigh Valley spread the puck around in Saturday’s overtime contest against the Penguins, with 12 different skaters all registering at least a point. 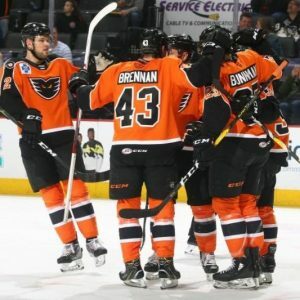 Service Electric’s TV2 Sports will again be broadcasting all of the Phantoms’ regular season home games live during the 2018-19 season. 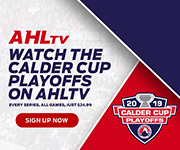 If you can’t make it out to the rink, be sure to catch all the exciting action in high definition with Steve Degler, Todd Fedoruk, Doug Heater, Dan Fremuth and Kristi Fulkerson! 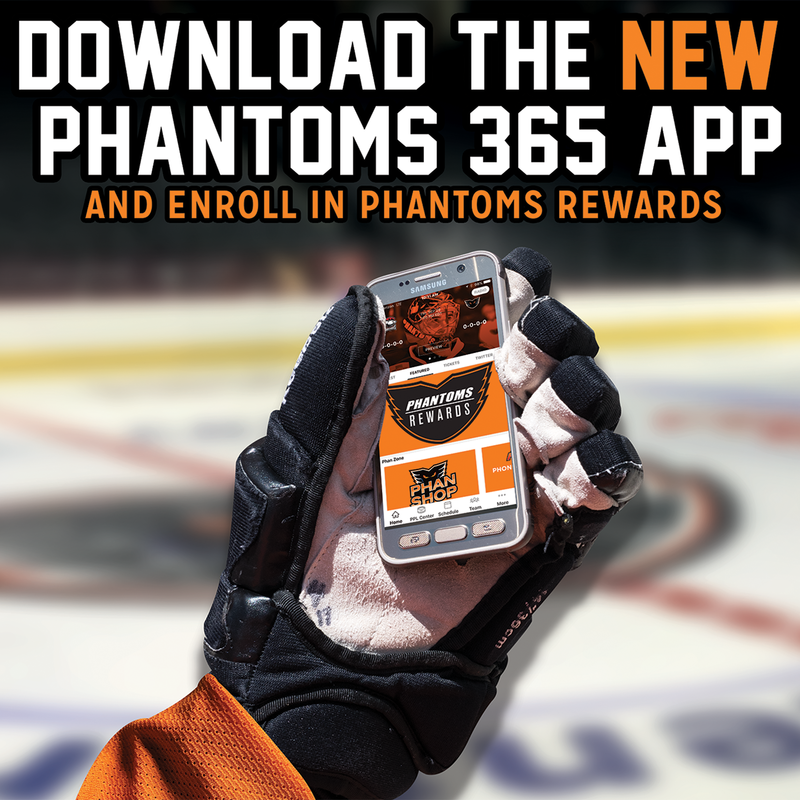 And be sure to catch each and every Phantoms game this season live on 1470-AM WSAN, 790-AM WAEB or via the Phantoms365 app! 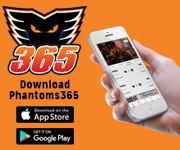 Join the Voice of the Phantoms, Bob Rotruck, for all of the heart-pumping action of Lehigh Valley Phantoms hockey whether the team is at home or on the road.